This is the answer for ice-cream lovers who are watching their fat in-take, want to eat healthier, and find it impossible to give up desserts. And since sorbets are made without dairy, vegans and those with lactose intolerance can also enjoy these treats. Substitute water for the cordial if you’re on the wagon. 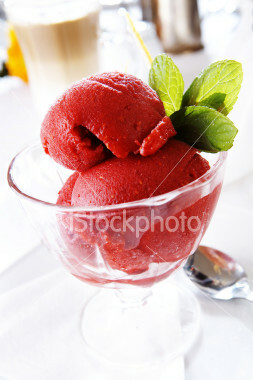 The more alcohol or sugar in the sorbet, the softer the end product. · Pour pureé into a blender (or food processor) with 1/2 cup water (or 1/4 cup water and 1/4 cup strawberry cordial), 1 Tbsp lemon juice, and ¾ cup sugar. Blend until sugar dissolves. · Chill thoroughly and freeze in an ice-cream machine according to manufacture’s instructions. · Transfer to a freezer-safe container and freeze until firm, about 2 hours. · Let ripened at room temperature for 10-15 minutes before scooping. Strawberry Cordial is easy to make using 2 cups vodka, 3 cups of crushed strawberries, 1 split vanilla bean (or 1 Tbsp vanilla extract), 1 broken cinnamon stick, 1/2 tsp cracked peppercorns, and 1/2 cup sugar. Put everything in a glass jar. Shake daily for 7 days. Strain through a sieve and filter through a paper coffee filter into a decanter. Fill decanter as full as possible to prevent evaporation of flavors.